The lawyers of the future may be less J.D. than R2D2. The law profession is being reshaped by new automation technologies that allow law firms to complete legal work in a fraction of the time and with far less manpower. Think IBM's "Jeopardy! "-winning computer Watson -- practicing law. "Watson the lawyer is coming," said Ralph Losey, a legal technology expert at the law firm Jackson Lewis. "He won't come up with the creative solutions, but when it comes to the regular games that lawyers play, he'll kill them." That means potentially huge cost savings for clients, though it's not so promising for law school graduates looking for work. 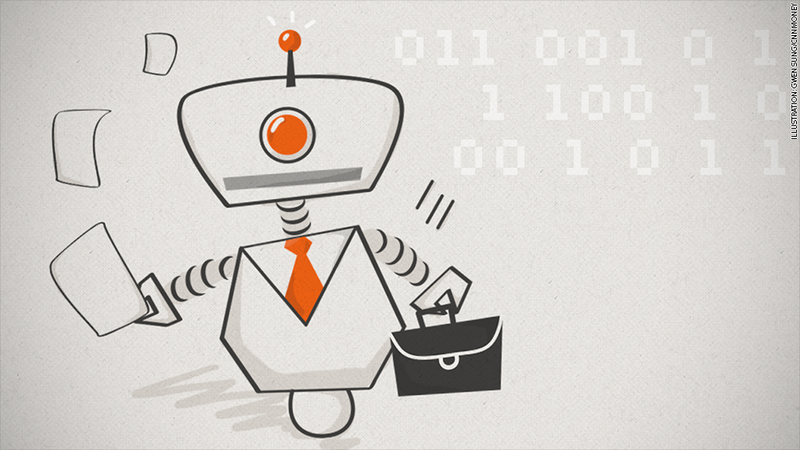 The good news for lawyers is that no one thinks the profession can be automated entirely. But lots of legal work is already being computerized by some firms, including the drafting of simple contracts and the search for evidence in reams of documents. Winston & Strawn is among the law firms that have adopted legal review technology known as predictive coding. Lawyers mark up relevant information in a subset of documents and feed that to a computer program that uses it as a basis for analyzing the entire data set. The software then surfaces potentially relevant evidence for review by lawyers. In a recent study, the firm found that its software was more effective than human reviewers in surfacing relevant documents, and helped it complete the review process in about a third of the time. "I don't think that the significance of this has caught on yet," said John Rosenthal, a partner at Winston & Strawn. "Probably less than 5% of the complex cases in the civil system are using these technologies." That could soon change. A federal court ruling in a 2012 case authorized the use of predictive coding, paving the way for wider adoption. And the amount of data that lawyers have to review has grown by leaps and bounds over the past decade due to the widespread use of email and text messages. The U.S. Chamber of Commerce said last May that 90% of the world's data had been produced in the preceding two years. "The amount of stuff you have to get through to find that core group of documents has exploded, even though the amount you present to a jury is similar," said Tim Harkness, a partner at Freshfields Bruckhaus Deringer. Industry experts say computers will soon be able to perform even more advanced legal functions than document reviews. In a paper released last year, Josh Blackman, an assistant professor at South Texas College of Law, wrote that artificial intelligence programs will "in the not-so-distant future" have the ability to advise on whether to file a lawsuit, predict how it might be resolved and even draft portions of legal briefs. But computers practicing law isn't necessarily a good thing. For instance, Blackman wonders who is responsible if clients get bad advice. Some firms have already faced criticism for the alleged misuse of legal technology. The New York Supreme Court censured law firm Cohen & Slamowitz last month for relying on technology to automatically send collection letters and file tens of thousands of lawsuits each year without reviewing the case files. In addition, the Electronic Frontier Foundation has accused Warner Bros. of using software algorithms to file mounds of erroneous copyright-infringement notices for online video sites like YouTube without actually reviewing the files in question. Warner Bros., a division of CNNMoney parent Time Warner (TWX), declined to comment; Cohen & Slamowitz did not respond to requests for comment. As law firms weigh the pros and cons of using algorithms instead of lawyers, technology might even render some of the firms themselves moot. "A person could download the app, explain his or her problem, and listen to possible remedies -- that may or may not involve paying a lawyer," Blackman wrote in his paper. This technology, he added, "would improve access to justice."